1. You began writing while still a student at Makerere University in Uganda. What inspired this passion for creative writing? My first story, Kefa Kazana, I wrote while at the university, was actually an English Literature assignment. The best stories were selected and published in Pen Point, a Dept. of Literature magazine and later published in ‘Origin East Africa Anthology’. 2. Ngugi wa Thiong’o championed the movement of African writers writing in their native languages. How important is writing in your indigenous language to you as a writer of fiction? Writing in one’s indigenous languages is a question that keeps popping up in many literary forums. Unfortunately, Ugandan society is a multi-ethnic, a multilingual one, with English as the only unifying language. So, no matter how much one might wish to write in one’s language, it is not very practical as it limits one’s readership to a small group of people. There is also the question of proficiency in the language. Our local languages are very rich with wide ranges of proverbs, idioms and vast other enthralling expressions but unfortunately, most of them were neglected during the colonial days with the result that while most of us can use them verbally, using them as a tool to write is quite challenging. But those who are comfortable writing in their languages, like the Baganda in Luganda, which is the most developed, do so. For the rest of us, English remains our pen language. 3. Explain your motivations for writing Cassandra? Firstly, I want to say that I love writing and ‘Cassandra’ is therefore a love child. Writing is also a mode of communication through which I try to reach my human beings`, especially women. I try to highlight social issues affecting women, and with my pen I try to encourage them to throw off their shackles and live full, enriched lives as equal citizens of the world. 4. Many political and social changes have occurred in Uganda since colonialism. What are some of the postcolonial issues addressed in your writings, and why are these themes important to discuss? Liberation and empowerment of women (social, economic and political), with emphasis on the education of the girl-child; these are themes that run through most of my works. 5. You have also written children’s literature. What motivated you to write books for children? There is a poor reading culture in Uganda which has sometimes, among other factors, been blamed on foreign reading material. Most of the books available to the public and used in schools are manufactured abroad, especially in Britain. This has recently resulted in a surge of Ugandan children writers, myself included, who are trying to fill the gap and provide children with reading material whose background and illustrations our children can relate to and easily assimilate. 6. You have edited several anthologies of women writers including Words from a Granary, an anthology of short stories by Ugandan women writers. What was your motivation for that project? I was working with FEMRITE – Uganda Women Writers Association for ten years (1997-2007) as an editor. It was therefore my job to edit the organization’s various publications that included magazines, journals, novels, poetry collections and various anthologies. But I also had the chance and privilege to mentor budding women writers and to watch them metamorphose into some of the nationally and internationally recognized writers. 7. What impact do you hope to make on your readers as an African writer? I hope that my works are widely read at home and abroad and are used as reference books in the study of contemporary African female literature (as indeed they already are by the literature departments of the various universities in the country) and as tools of development with regard to women issues. I also believe there are readers who simply read for pleasure and would feel flattered if they found my books entertaining. 8. In your novel Cassandra, there is a theme of the liberation of women from oppressive traditional practices. How does fictionalizing this theme contribute to the emancipation of women in Uganda and Africa at large? Fictionalizing a theme like liberation of women from oppressive traditional practices is a powerful way of calling attention to the social evils, for the written word tends to have a longer lasting effect than a spoken one, or so I believe. Women readers are shown the way out of the darkness encompassing them into the light, using the characters in the novel as torchbearers or role-models. 9. Your play “Over My Dead Body” was published in the African Women Playwrights anthology and won the British Council New Playwriting award for Africa and the Middle East in 1997. Why do you think the play was so well received? ‘Over My Dead Body’ tackled real issues of poverty and education of the girl-child. The latter was a favorite topic of proponents of education for all at the time, which must have appealed to the panel of judges positively. The judges also did say that the play painted an optimistic picture, in spite of everything, which was all to the good. 10. As a writer, you must have drawn inspiration from predecessors. Who are some of your favorite writers, and how have they influenced you? Shakespeare is my – all -time favorite. Bernard Shaw, Thomas Hardy, Graham Greene, Jane Austin, Henrik Ibsen, Agatha Christie and many other classic writers have all inspired me to write, and (to) some extent, influenced my style. All Shakespeare’s works are laced with humor, including the tragedies; that goes for most writers of that period, especially Bernard Shaw. My contemporary favorites include Achebe, John Ruganda, Maya Angelou, Jeffrey Archer, Sidney Sheldon, P. D. James and a host of others too many to enumerate here. 11. A major theme in many of your works is for women to overcome their subjugated condition that society has created but at the same time maintaining their important roles as mothers and wives. How do your female characters balance these roles? I believe that while men and women are made equal in the eyes of God and should be in the eyes of man too, physically they are different. Thus you find that although I don’t subscribe to the superior and inferior sexes, I do advocate for harmonious co-existence for the sake of maintaining stability in society. Man and woman are supposed to complement each other rather than engage in constant gender wars. 12. What role do you play in helping women to develop their voice in writing? I occasionally get requests from young writers to go through their manuscripts and advise them both from FEMRITE and outside, especially school girls when I am invited to talk about my work and creative writing in general. 13. You are a wife, mother, accomplished writer, publicist, and are involved in many writing projects. How do you successfully manage each of these roles? I am semi-retired now and able to devote most of my time to my favorite pastime, writing. My children are all now grown up and living away from home, so it is just my husband and I most of the time. I am still a member of FEMRITE though, and regularly attend the various meetings, even volunteer for occasional assignments, especially editing their publications, but by and large, my time is my own now. I am working on a story with the working title of ‘Man on a Mission’, that touches both on politics and religion. I have other small projects of short stories and stories for children. 15. Any final word for budding writers in Africa? Writing is a selfless endeavor, especially here in Africa, a lifelong commitment that one is required to give one’s best. It is also abound with frustrations when publishers don’t return your calls and literary critiques fail to see a best-seller in your work. But for the dedicated writer, don’t get discouraged, don’t give up and file whatever you write. Keep trying and one day you will get the recognition you deserve. I also advise budding writers to read widely if they want to succeed. LaKeisha L. Caples is a graduate student at the University of Wisconsin, Madison, where she is working towards a PhD in African languages and literature. 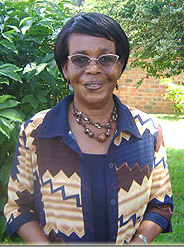 She is an advanced Kiswahili speaker who is currently researching East African popular culture and pedagogy. Caples received her BA and MA in English from Chicago State University. She is also a songwriter, poet, and screenwriter. “no matter how much one might wish to write in one’s language, it is not very practical as it limits one’s readership to a small group of people. There is also the question of proficiency in the language. Our local languages are very rich with wide ranges of proverbs, idioms and vast other enthralling expressions but unfortunately, most of them were neglected during the colonial days”.